On a UK Monopoly Board, Piccadilly is the sixth most expensive property at a whopping £280.00 and bears the colour yellow. To build a Monopoly hotel on the site will set you back £1,200.00. In reality, Piccadilly is a busy, multi-lane thoroughfare in London’s West End, running from Hyde Park Corner past Green Park to Piccadilly Circus. It’s home to the Hard Rock Café, The Ritz and the Royal Academy. Piccadilly is where Russian spy, Alexander Litvenenko visited a branch of Itsu just after he was poisoned by polonium, a deadly radioactive substance, in a modern-day Cold War power struggle. It’s where to browse through book stacks at the amply-stocked bookstores of Hatchard’s and Waterstone’s, ogle gourmet delights at Fortnum and Mason and Caviar House or refuel at The Wolseley, where weekend brunch tables are a hot ticket. With such esteemed neighbours, both historic and present, it’s no surprise that Piccadilly is where the French hotel chain, Le Méridien, decided to install their landmark London hotel – a stone’s throw from Eros and the Circus’s famed flashing signs. It has now resided at the Regency property of number 21 Piccadilly for a sound twenty-six years, since 1986, in a purpose-built building that first housed The Piccadilly Hotel in 1908 and Masonic temples in its basement. I’m ashamed to admit that Le Méridien on Piccadilly is a place I must have passed thousands of times yet never once entered and I cannot fathom why. This has recently been rectified; not only have I now entered Le Méridien Piccadilly, I’ve also luxuriated in its underground swimming pool and snored soundly in one of its gigantic beds, oblivious to the busy West End traffic artery located mere feet from my head. My recent stay at Le Méridien has also educated me in their all-pervading approach to art. The arrival art is what a guest encounters first. As part of Le Méridien’s re-branding at the hand of the Starwood Hotels and Resorts group since they took ownership of the chain in 2005, art has been incorporated into all areas of the guest experience, starting the moment you walk through the door. 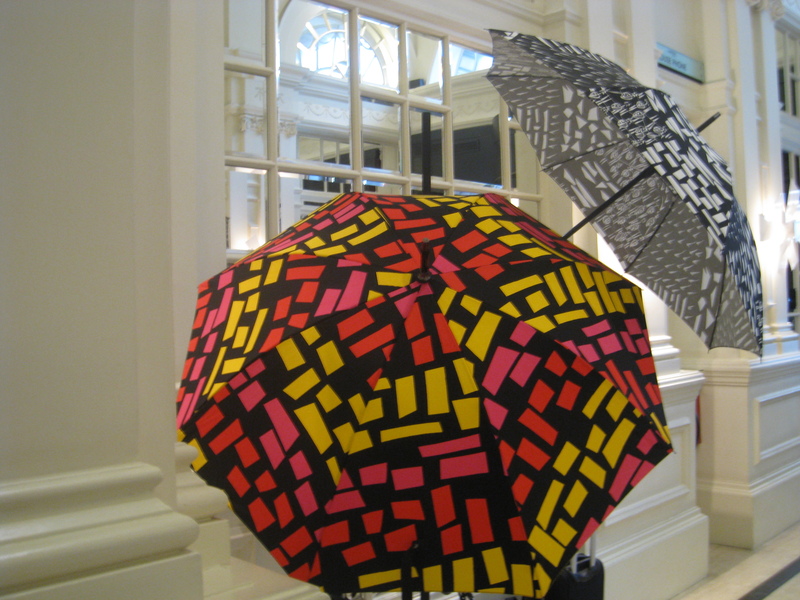 Before I’d even reached the check-in desk I’d already noted a display of limited edition umbrellas by designer Duro Olowu, with snazzy geometric prints that any connoisseur would be happy to shelter beneath in a London rainstorm. Even the lowly key card has been welcomed into the LM artistic experience. My card, a work of art in its own right, sported part of a Yan Lei Colour Wheel, its design being part of the LM Unlock Art incentive: not only does the key card open your door it forms part of a collection by a contemporary artist. The current featured artist at LM Piccadilly is Langfang-born Yan Lei, a member of the LM100, the collective comprising 100 influencers who contribute to the LM experience, through their expertise across a wide selection of the arts, from art and design to cuisine and perfumery. Some of the previous Unlock Art card collections, by fellow LM100 members, Hisham Bharoocha and Sam Samore, hang in frames by the lifts, but form and function are only two facets to the LM key cards; they also provide free access to Tate Britain and Tate Modern exhibitions – all you have to do is tell the concierge which Tate exhibitions you’d like to attend so he can arrange access for you, then just flash your key card when you get there, unlocking a local cultural experience for free. Yan Lei’s Colour Wheel paintings hang in the Piccadilly lobby, the bespoke carpets underfoot are awash with lines, thoughtfully reflecting the inspiration for the company’s name – the meridian lines which criss-cross the globe, and in the ground floor internet den the shelves are set with contemporary ceramics, smart and stark against a dark background. 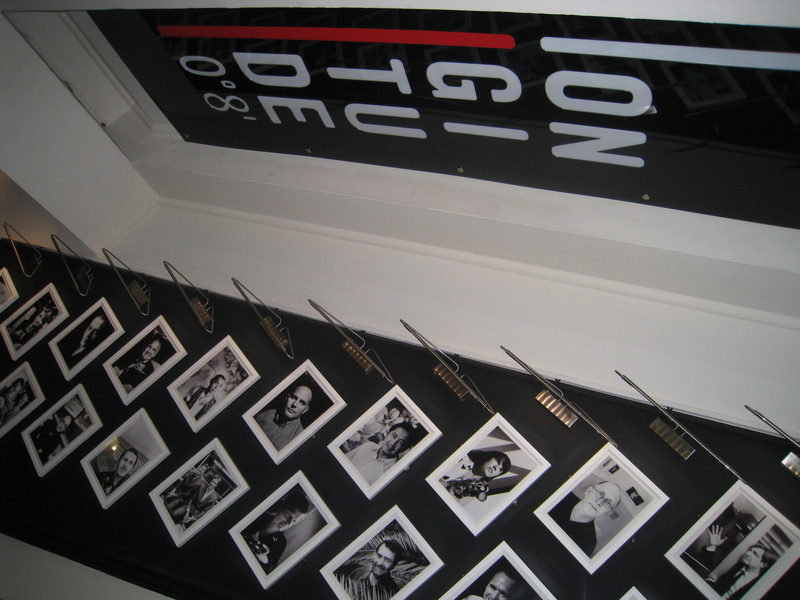 There’s a video installation, created especially for Le Méridien, playing on a loop behind the Guest Relations desk and, on your way to the Longitude Bar, you’ll pass an elegant series of black and white portraits of the people responsible for the overall artistic experience that a guest will enjoy at Le Méridien – the LM100. As for that subtle aroma wafting through the lobby? That’s the signature Le Méridien scented candle, LM01, created by more members of the LM100 clan, Fabrice Penot and Edouard Roschi. It’s a unique blend of frankincense, iris absolute and musk with cedar notes, gently adding to the sensory welcome so carefully constructed with a guest’s first impressions in mind. The final and possibly most important part of Le Méridien’s atmosphere is the human component. In my time at the hotel I truly appreciated the comportment of the staff. From greeting to leaving, there was always a smile, a courteous hand, nothing too much trouble. Lift doors were held open without asking, a troublesome door catch dealt with immediately by not one but three kind and patient staff, an unusual breakfast order delivered on-time, without issue, a forgotten toothbrush taken care of, taxi doors opened and closed, a myriad small kindnesses. Whomever I spoke with on the staff seemed to genuinely care that I had a positive experience of Le Méridien Piccadilly. That’s what I call the Art of Hospitality, and in the travel environment it’s absolutely priceless.